Course Calendar for Weeks 6-10. Finish Chaper 14 in Escholz and Rosa, carefully look over chapters 4 and 16. Reading Journal 5 on "Dynamic for Democracy," (High Points, April, 1942, pps. 36-46), by Molendyk and Edwards (.pdf). Article reproduced and posted for classroom use only. Optional: Background resource for journal article 5: Teaching English in Wartime: A Brief Guide. (1942). Index of Prohibited Words introduced. Resource article (Tentative): "Germany to probe Nazi-era medical science," by Megan Gannon. Tentative: Respond--Should any further Nazi-era human brain tissue samples that are discovered and were taken from people who were murdered in the Holocaust be (1.) simply incinerated as medical waste as soon as they are discovered, or (2.) should they be permanently preserved as evidence and for future valuable scientific study, or (3.) should they be ceremonially buried in a cemetery with a proper funeral, as the last physical remains of these tragic victims? Why? Draft of Summary due Wednesday/Thursday for review in class. Students who fail to bring draft of Summary will be asked to leave, and will be assigned a "zero" for all work for the day. Wednesday: Tentative Video if not seen already: The Fall of Berlin (~10 min). Trigger warning: Extreme combat violence and destruction. May be upsetting to some viewers. Russian audio with English subtitles. Tentative: The One Hour Rule–how to retain new learning. Discussion: Finding implications and inferences: Finding what is not said in the text: .Resource: Taking one for the team. (May work only on campus computers). Tentative Resource: Heroic Chaplains. Tentative: Respond. Read Chapter 5 in Escholz and Rosa. Reading Journal 6 on "Defeated Land," by Sidney Olson, Life magazine, May 14, 1945, Pages 39, and 103-110. 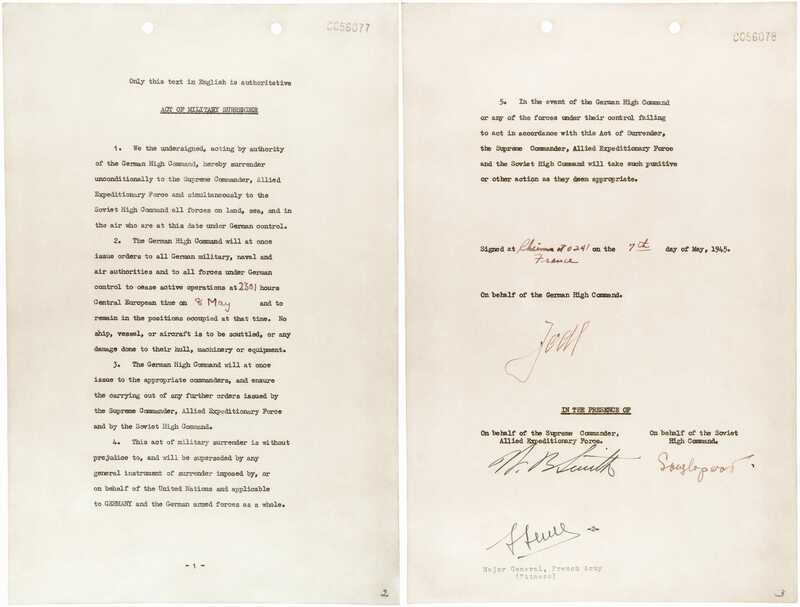 Background resource: Nazi Surrender Document, May, 1945. Optional resource: The Peat Bog Soldiers (Paul Robeson) Audio, ~2 1/2 minutes. Lyrics. Discuss Quality Control in Writing: Resource from Pro Writing Aid: "What Editing Issues Fast Track Writing Submissions to the Reject Pile?" by Susan Maccarelli. Respond to last week's audio, "VE Day Special." Reading Project: Introduce weekly reading journals for rest of semester, on Hiroshima. Tentative video: Trailer for The Man in the High Castle. (May require Facebook sign-on). ~2 min. Tentative resource: Deported Parents Losing their Children. (10/9/2018). Tentative resource: "We Didn't Know," by Tom Paxton (audio, ~2 1/2 min.) Lyrics for song. WARNING: contains obscene racist word. Discuss the two kinds of comparison. MondayTuesday: Resource: More about Alcoholism. (Read Chapter 3). Tentative analysis question: What is the easiest way to self-diagnose alcoholism? Optional Resource: A cure for alcoholism? (2018) Tentative: Summarize. Video: The Effect of War on Children (1946. ~20 min.). Trigger warning: May be seriously upsetting to viewers. No subtitles. Optional Resource (Poem): The American Child, by Paul Enge. ALL SIX READING JOURNALS DUE by Wed., Mar. 6/Thurs. Mar. 7 AT BEGINNING OF CLASS, FOR MIDTERM GRADING. Staple all journals together. Tentative: Summarize "UTEP Study finds Links between Childhood Adversity, Burnout and Depression." 1/22/1944. From Newspapers.com. Reproduced for classroom use only. Read Chapter 6 in Escholz and Rosa. Begin reading Hiroshima, by John Hershey. Reading Journal 7on Hiroshima, from beginning of the book, up to the beginning of the story of Father William Kleinsorge. Mon./Tues. : Take Midterm Exam, on BlackBoard. Instructions to be provided. Wed., Mar. 13/Thurs., Mar. 14, Final draft of Summary due at beginning of class. Video: Fascism in the USA? (From NY Times) (Oct. 15, 2018) ~5 min. Warning: May offend some viewers. Evidently no usable subtitles. Thurs/Fri: How to argue: The ISARC format for argument (a guide). Exercise: argue in ISARC format whether or not finishing this semester without quitting this class or dropping out, and ultimately the whole task of getting your college degree is "worth the hassle" at this point for you, personally. Be careful to use "I, me, my, we, and us" in your answer. Please be honest! Optional resource (2017), Study Identifies Factors that Lead to Greater College Success. Tentative resource for summary practice: Indifference to a Hellish World (2018). Outline main points for a summary. Reader response: The dark side--how to attack a text or standpoint [Refutation}. Distribute handout: "The Dark Side." Optional Resource for understanding refutation: Anticipating others' false beliefs ("Theory of Mind") and apes. Tentative Resource: Read brief text selection from the story "Moon of Ice," by Brad Linaweaver (1982). [Trigger warning! Content is entirely fictional, and may be seriously offensive to some readers!] Compose a brief, five-sentence ISARC argument with your opinion on the following question: If history had gone differently, could such a world as described in this story have ever existed? Why or why not? March 18-22 SPRING BREAK, No classes. Start reading Chapter 8 of Escholz and Rosa. Photo: Sophie Scholl, executed at age 21 for leading student resistance to Hitler. Reading Journal 8 on Hiroshima, from the beginning of the story of Father Kleinsorge up to the beginning of Chapter II, "The Fire." Mon./Tues. : Comparison Essay introduced. Assignment officially issued. Discuss the two kinds of comparison. Final Draft due Thursday, April 11 or Friday, April 12, at beginning of class. Tentative analytical response: Argue in ISARC format: Do wars "just happen" at certain times, sort of like hurricanes or earthquakes? Or can and should we as citizens do anything to prevent or resist them? Resource for comparing people: Comparison (Synkrisis). Tentative resource: Behavior in High School Predicts Income and Occupational Success Later in Life. Tentative resource: College may have become more valuable. Tentative resource: NY Times article on college and the need to get sufficient sleep (2018). Tentative summary practice resource: Sleep Disturbances More Common for Immigrants than Non-immigrants. (2018). Tentative summary practice resource: Don't try it even once: "Research Shows a Single Dose of Cocaine Irreversibly Alters Brain." (2018). Tuesday/Wednesday/ Check of class notes. Review your notes on the two kinds of comparison, and Three Big Rules. Wed./Thurs. : Learning by reading out loud. Resource (to be read out loud): Litany for Dictatorships, by Steven Vincent Benét (Molendyk & Edwards, 1942, pps. 7-10). Additional Resource (Tentative: To be read out loud in class): "Can we Avoid History's Blood-Dimmed Tide?" by John Case (2011). Tentative background resource: Beyond Superstition (2018). Tentative: Summary practice. Tentative resource: German Teens who Rebelled against Hitler. Tentative background resource: Sophie Scholl: A Lesson in Courageous Resistance. Tentative: Response. Friday, Mar. 29, Cesar Chavez Day, no classes. Finish reading Chapter 8 in Escholz and Rosa; carefully look over Chapters 9 and 16. Reading Journal 9 on Hiroshima, up to the beginning of Chapter III, "Details are being investigated." Comparison Essay continued. Wed./Thu. : Notes due on research, on the two magazine issues. Wed./Thurs..: Revising and proofreading (slide show). Generic rubric sheet distributed. Quality control expectations for Comparison Essay and other college assignment. Tentative Resource: "Aftermath" (poem), by Siegfried Sassoon. Note: The above poem is from World War I, but Molendyk and Edwards include it in their 1947 anthology (pps. 78-79) in reference to World War II. Resource: Human/Pig chimeras. Tentative: Personal ISARC response: Should scientists continue to create human/animal chimeras? Tentative Resource: (Audio/video) When the Lights Go On Again All Over the World, by Vera Lynn. (~3 1/2 min. )Discuss personal reaction to song. Resource: (Audio/Video): There'll be Bluebirds Over the White Cliffs of Dover. Click here for Course Calendar for Weeks 11-16.